Christine (right) and I (left) putting down the first layer of paint. One project I was ecstatic to be a part of was painting a mural in La Chorera. I love murals because they are an inclusive art form that serves to share ideas and perspectives which contribute to the space it takes. One of my favorite muralists is Diego Rivera; his frescoes served as inspiration and to speak truth about society and politics as well as nature and science. I never thought I would work on a mural, and it was empowering and something I hope everyone does at some point in their lives. 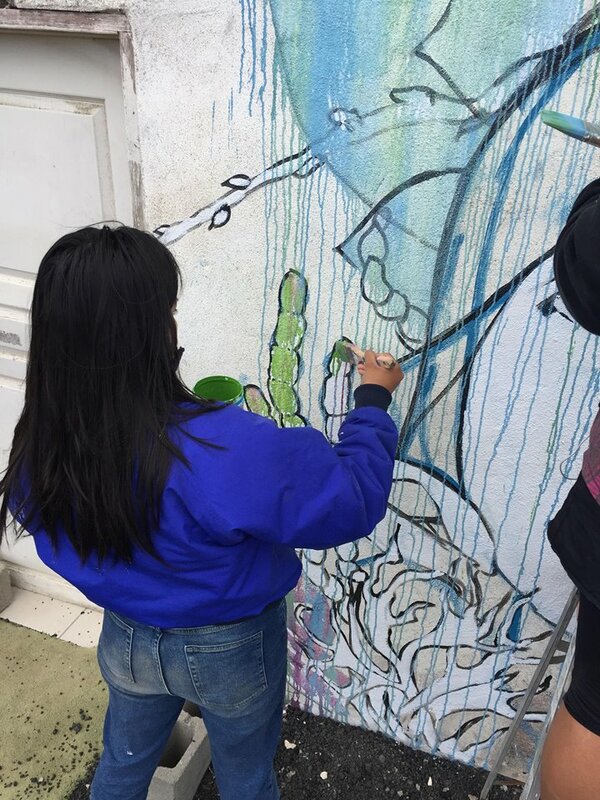 Esther Gamez is the artist who had the vision for the mural, inspired by native flora and fauna of San Quintin area. As you can see, the woman in the mural has a Dudleya on her head that is meant to be a crown, and she is surrounded by lichen, seagrass, and a bird skull, all things Esther has found in the area. While working with Esther, I learned about her process in creating murals. First she starts with a rough sketch on the wall, which she either does free hand from a smaller sketch or she will use a projector if it is a large mural. Then, she puts down a white base so that the colors she will use will be brighter. Christine and I helped with this part of the mural, as well as laying down the paint. Esther has a distinctive style she likes to use, which includes letting paint drip down the wall to create layers and to add texture to her murals. It was a lot of fun to paint this way because it felt less confining, and I felt a lot less pressure to make sure I colored within the lines. Esther finished the mural by adding details and highlights on the mural that now rests in front of the beach in La Chorera. Murals are important in beautifying communities and in bringing art to the public sphere. Murals are accessible to everyone and may serve to inspire or to move the widespread audience. In the six hours we were there, I noticed about twenty people passing on that road. Some were young children, some were students walking from school, and some were commuting to and from work. Most seemed happy to see us painting on the abandoned building, and some even gave us encouraging words and smiles. I hope to see more community driven murals in the communities of San Quintin. I know there are talented artists in the community. One famous sculpture in the area called “La Ola” or “The Wave” was created by a man named Don Chava, who was born and raised in San Quintin. During my trips to the area, I met children from La Chorera who could draw and paint incredible animals and landscapes.